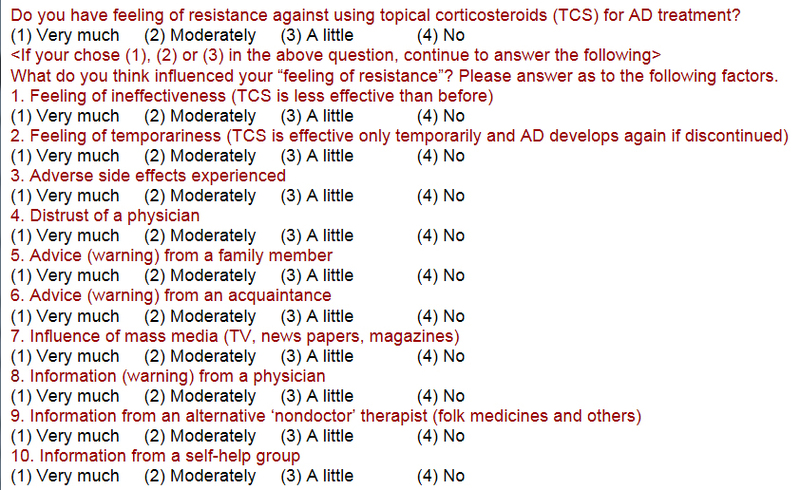 Why Do Patients with Atopic Dermatitis Refuse to Apply Topical Corticosteroids? Though I refer to my paper here, I don’t intend to stand out at all. There always comes an opinion that it is not a good idea to unnecessarily make patients nervous. Therefore I’d like to present the basic data based on which I alert to steroid addiction. This paper analyzes the information collected between 1998 and 1999 by distributing 3047 copies of questionnaires to individuals with atopic dermatitis (AD) with the cooperation of 18 hospitals/clinics and 11 patient organizations. I got responses from 1558 patients. Excerpted below are the items related to addiction. Comparison was made between patients who were using TCS and those who were not to consider what the reason for feeling of resistance among steroid non-users is. The results are shown in the above table. Much difference was not found excluding the following two items: “feeling of ineffectiveness” and “adverse side effects.”Patients refusing TCS application were not much influenced by information from mass media (TV, news papers, magazines) or advice (warning) from physicians as is often said. They refuse TCS based on their experience without relying on (or being able to rely on) anything. I noticed a very interesting fact analyzing the questionnaire results. Comparing the result of “distrust of a physician”with that of “information (warning) from a physician, the more information (warning) patients get from a physician, the less the rate for distrust of a physician becomes. That is, the more doctors warn patients about steroid adverse effects, the more trust doctors can gain from patients. It is understandable. Imagine you are considering purchasing some financial products. Can you believe in a sales person who only stresses the advantages without explaining the risks? Let’s go back to the major point. In informing of steroid addiction through the book like this, there always comes an opinion that, “it is not a good idea to unnecessarily make patients feel unsafe”. But such an opinion is not right considering the above-mentioned data. Notifying the risk of steroid addiction itself is the shortest way for dermatologists to regain patient trust. What is most required for dermatologists is the ability to exactly explain addiction or withdrawal without dodging the subject when asked by patients if they’ve become addicted to steroids. What I’d like to say to dermatologists insisting it is not a good idea to unnecessarily make patients nervous is that it’s a hypocritical attitude, the ugliest side of human beings, whether they notice it or not. They want to relieve themselves, not patients by looking away from unfavorable facts. I’m not criticizing them unilaterally. I also have such sentiment. Everybody wants to be considered a good person. Such a feeling sometimes does good to others, but sometimes turns into self-satisfaction that harms others.